Discovery has announced what is sure to become an instant hit with their new show BOSS HOG. The show premiers today (April 11th) at 10:00 p.m. ET/PT and is packed full of entertainment that has really been developed for a wide audience. It’s a unique show that I think truly is a “one-of-a-kind” program and I was lucky enough to be invited to view the first episode prior to tonight’s debut. BOSS HOG on the Discovery Channel is a show that gives the viewers a firsthand look at the wild hog problem in the state of Texas. Brian “Pigman” Quaca has created his own wild hog business called Pigtime Enterprises and he has found amazing ways to make money off of the wild hogs that devastate and destroy valuable land, animals and other things. He says, “If it’s got to do with a pig, I’m going to find a way to make money off of it!” and he means it! He is a brilliant man who is a larger than life character and is always entertaining. Through Pigtime Enterprises, Pigman has developed guided hog hunts, customized hog hunting equipment and hunting blinds, a thriving taxidermy business and much, much more. BOSS HOG is a lot more than just Pigman operating Pigtime Enterprises and the show seems to strike a perfect balance between his dependency on wild hogs while he aims to eliminate their destructive force. Pigtime Enterprises seems to thrive from Quaca’s unstoppable drive to succeed but he can’t run it all by himself. He has a full team of employees that truly are a “cast of characters” that is led by his dad, Dap. Dap is what America thinks of when they visualize a Texan. He walks the walk and talks the talk. Dap seems to find a way to always make a mountain out of a mole hill but he gets the job done and is a big reason for the success of the hunting ventures that Pigtime Enterprises offers. The team includes other personalities, like Snag, who add to what I think is a show full of laughs and entertainment. One of the greatest things about BOSS HOG is that it features something that I am passionate about – BBQ! Pigman has teamed up with Wright’s BBQ which is a local BBQ restaurant in Texas that has been in business for over 50 years. They serve what looks to be traditional Texas BBQ and I’d love to grab a seat at one of their tables. With the addition of this aspect of BOSS HOG, I really felt an instant connection with the show. Quita with Wright’s BBQ is the main person that we watch as she operated the business and also has to deal with some “larger than life” ideas that are presented to her. Her relationship with Dap is absolutely hilarious and I think the interaction that the viewers get to see between Quita and Dap could be some of the best highlights. I have a feeling that Quita really didn’t know what she was getting herself into when she agreed to work with Pigman and his team! This really is a great show that I think will become something that we get to see for many seasons on Discovery. It’s fun to watch the Pigman Enterprises business in addition to the entertainment and laughs that each character provides. It also delivers a good message about business and family because of Pigman’s goal to pass on his business to his son which is one his main motivations. 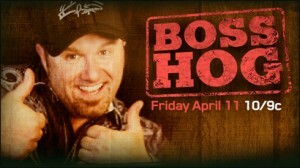 I strongly encourage everyone to check out BOSS HOG tonight, April 11th on Discovery at 10:00 p.m. ET/PT. I can guarantee that you’ll be happy you did and I am pretty sure you’ll become a fan of the show like me!